People can go their whole lives without noticing the message that higher powers are sending them. The concept of guardian angels is an old one. This idea is mirrored in the concept of Angel Numbers. This is the idea that there are spiritual entities that give mortals guidance throughout their lives. Furthermore, these entities can foresee our destiny. Let’s find out more about Angel number 3. They know where our journey is leading and how we can get there successfully. It is the “job” of these guardian angels to help us achieve our goal and fulfill our purpose. For this reason, they seek to provide us with guidance and wisdom to do so. Angels cannot speak with us directly. But they are cunning entities that will make their messages known through the use of Angel Numbers. There is nothing spectacular in the presence of these numbers. They appear to us in the most mundane fashion. We might see them on our odometer or the clock. Perhaps we find them in novels or on our electricity bill. For this reason, it is common to overlook these messages and completely miss out on the power behind them. By understand and accepting Angel Numbers, we open ourselves up to communication with the spiritual realm. What Does Angel Number 3 Mean? Perhaps you are wondering what is so special about the number 3. 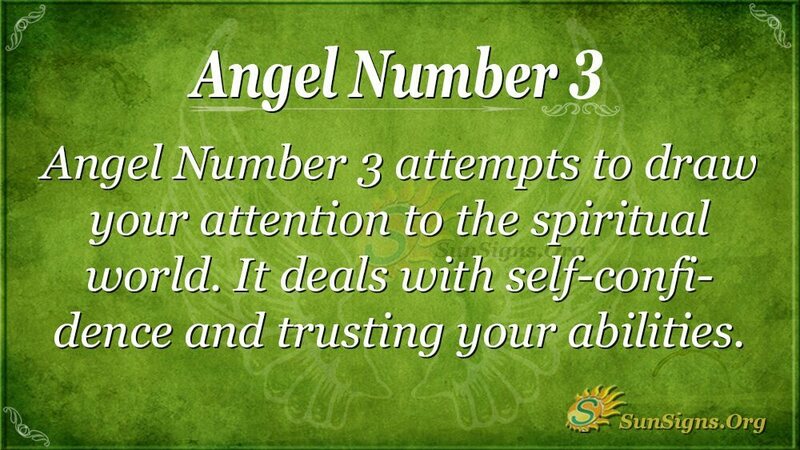 Well, Angel Number 3 is an exceptional message to receive from the spiritual realm. People who are subject to this message should embrace this message. The number three is often associated with the holy trinity. Likewise, Angel Number 3 attempts to draw your attention to the spiritual world. It gives you information about your possible association with the spiritual world. Your connection to them is strong, and they can hear your desires and prayers. What Does 3 Mean in Angel Numbers? This number of the angels serves as a message of loving affirmation. It is possible that the higher powers are seeing your long-term goals and are expressing their approval of them. For this reason, it is a good time for you to trust your instincts and continue pursuing your path. Do so with exuberance and dedication. As you continue you forward, your angels will be with you for support. Because Angel Number three deals so much with self-confidence and trust, this might also translate into the creative realm. This message could be an attempt to push you into accessing your artistic side. If you have been taking up a new hobby or skill, for example, you might be seeing Angel Number 3 because this is the right thing for you to be doing. Perhaps pursuing this new passion will lead you to your divine purpose, and you will find a fulfilling new path. Even though things are going smoothly, that does not mean you should shy away from taking chances. Equally, this is a great time to branch out. The spiritual realm is behind you in full support, and you should be trusting in your judgment. It is always difficult to know exactly what your guardians are leading you towards. However, if you are seeing Angel Number 3, you can be assured that you are doing something right. Your connection to the spiritual realm is potent during this phase, and they are showing their support for you. Things are working themselves out nicely, and as long as you keep your focus. Pay attention to the signs from the spiritual realms, and trust in yourself. Then you will find your true life path. Happiness and success will certainly come your way. Previous Angel Number 2 Meaning? Discover The Truth! Next Angel Number 4 – What Nobody Is Telling About It?